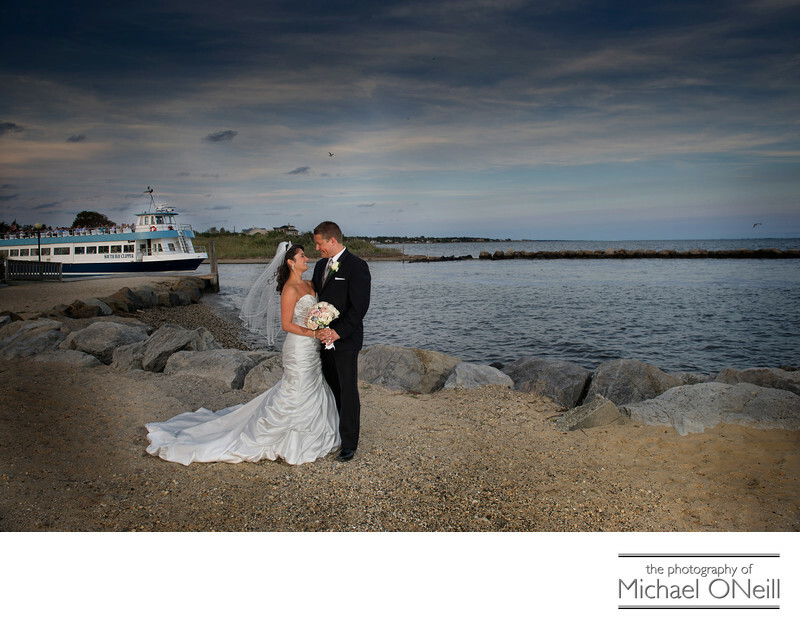 This fine wedding photograph was made on the beach in front of Land’s End Caterers in Sayville, NY. This establishment is one of my favorite Long Island waterfront venues. Located right on the Great South Bay it offers spectacular waterfront vistas and remarkable sunsets. The ferry seen in the background is on it’s way over to Fire Island, a famous weekend and vacation retreat on the Atlantic Ocean. Every bride that is looking for a waterfront location for her wedding should put Land’s End on her short list of places to visit. Not only is the location amazing, but the catering is top shelf. The main ballroom, pictured elsewhere on this web site is contemporary and uniques. Operated by the same folks that manage Flowerfield Celebrations in St. James, NY, Land’s End offers brides and grooms one of the most elegant, private catering experiences anywhere on Long Island. Over the years I have had much experience producing awesome wedding pictures at both of these fine establishments.